"What does it mean when a book makes you feel like you can sing?" Chuck Klosterman wrote an extremely excellent review of Turn Around Bright Eyes for Amazon. 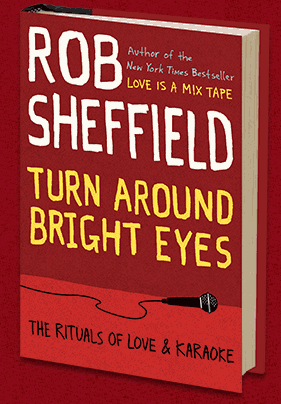 From Chuck's review: "There is no question about life that Rob Sheffield cannot answer through the lyrics of a Top 40 song everyone else forgot to remember. He understands Rod Stewart the way Frederick Exley understood Frank Gifford. He understands made-for-TV Lifetime movies the way Joan Didion understood hippies. He understands Bon Jovi slightly more than the members of Bon Jovi. He understands why life hurts and why life feels good. You know, I must be honest: karaoke scares me. It’s my greatest phobia. I could speak in front of 20,000 people, but I couldn’t sing in front of two. I’m a little ashamed of this fact, and there’s nothing I can do about it. But reading this book makes me feel like that fear doesn’t exist. It makes me feel like I just drunkenly sang “Whole Lotta Love” and totally killed it. I’m not even sure what that means. What does it mean when a book makes you feel like you can sing? Turn Around Bright Eyes on NPR's "Weekend Edition"
Turn Around Bright Eyes has been selected as a Barnes & Noble “Best Book of the Month." Barnes & Noble "Best Books of the Month"
Turn Around Bright Eyes has been selected as a "Best Book of the Month" for August at Amazon.com!